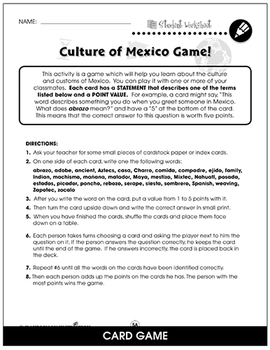 This FREE bonus resource includes extension activity worksheets from our Mexican Government Gr. 5-8 title. 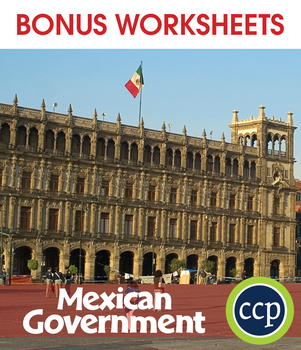 Enjoy 6 BONUS worksheets from Mexican Government Gr. 5-8. 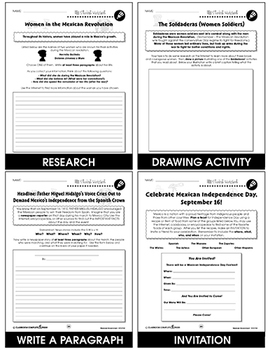 These worksheets can be used on their own, or paired with the individual resources as extension activities at the completion of the unit. And the best part is, it's FREE. Our resource combines high interest concepts with low vocabulary to ensure all learners comprehend the concepts presented in this resource. Visit a country with a rich history of fighting for liberty and independence. Our resource outlines how Mexico's Constitution is written to ensure no one person or branch of government has too much power. Examine article 3 of the Mexican Constitution, which states everyone has the right to an education. Then, explain why the abolishment of slavery was included in the Constitution of 1917. Read the presidential oath of office and determine exactly what the president is promising to do while in office. Explore the departments of the Executive Branch, such as the department of Health, Environment, Tourism, and Agriculture. Gain an understanding of the different political parties in the United Mexican States and what each stands for. Brainstorm the kind of qualities the leader of Mexico should possess. 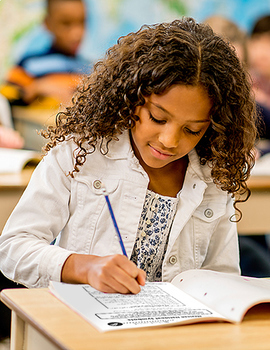 Aligned to your State Standards and written to Bloom's Taxonomy, additional writing tasks, crossword, word search, comprehension quiz and answer key are also included.